Is Metstrade right for your company? Some longtime exhibitors say go, while others advise caution. The stats are impressive, some slightly mind-boggling. Metstrade has 48 nationalities among its 1,600 exhibiting companies, and the show attracts visitors from more than 105 countries. The 721,000 square feet of exhibit space has 357,577 square feet — 8.2 acres — of blue carpet in the aisles that connect the 11 large halls. Any first-time U.S. visitor to the Amsterdam event marvels at the oceans of exhibitor booths, from components distributors with thousands of SKUs to custom electronics manufacturers in the Superyacht Pavilion. About 178 U.S. equipment companies are expected to be represented at this year’s Metstrade, compared with 161 three years ago. The USA Pavilion is the fourth largest (behind Italy, the Netherlands and the United Kingdom) with 100 companies this year — 15 more than in 2015. Canada is planning to have 20 companies at the show. 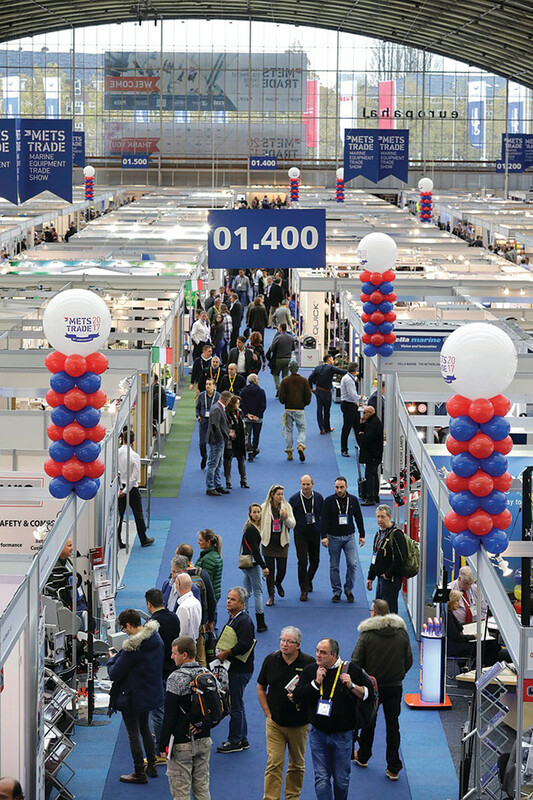 Beyond its size, the difference between Metstrade and every other marine trade show is a focus on emerging trends. Metstrade has primary exhibitors in the main halls, along with a Superyacht Pavilion, Marina & Yard Pavilion and Construction & Material Pavilion. It also has areas like the E-nnovationLab (electric and hybrid technology), I-nnovationLab (innovations and lectures on new technologies) and a MaterialDistrict Pop-Up focusing on high-end materials for boats. This year’s event includes the discussions “How Green is Green in the Leisure Marine World” and “Toward Cleaner, Healthier Oceans and Waterways.” The former will discuss sustainability measures and their long-term environmental impact, and the latter will explore how marinas, nonprofits and sailing organizations are contributing to ocean conservation. “The first discussion could be controversial but will provide a life-cycle assessment of our products. The second will include experts discussing how the industry is supporting ocean conservation,” Franklin says. “They’re both hot issues that could impact boat usage over the next 10 years.” — M.V.